We are preparing to welcome our second baby girl in a week now and do believe me that for me, the nesting time has been a real thing this time. I have honestly found myself looking for newborn romper and hat patterns on Pinterest and Etsy and I have been knitting, crocheting and DIYing like crazy. Besides all the baby preparations and the house cleaning, this time I also read a lot into newborn photography, ideas for props and outfits, as I really want to get better at taking pictures of the girls. Full of hormones and super emotional, I got lost in a sea of Etsy. My husband has definitely heard a lot of “aww, so cute” in the past month or so. And I have seen his left eyebrow raise just as many times when I got all emotional. After all this research, I realized 2 things. First of all, that I have spent so much time researching for all these props and basically found some of the most amazing shops on Etsy for newborns. This might be super helpful for anyone starting out with newborn photography, or even just researching outfits for their little human´s first pictures. Plus there is this baby cute factor that as an expecting mommy you just want to share with the world. And secondly, I realized that I can also test promoting Etsy as my affiliate since they are my go-to place for beautiful things and I would endorse them with my full heart anytime in real life. As a result, I have gathered and split the stuff I found into a few useful categories and based my research on under 25 $ per item. This is as cheap as it gets considering how special each of them really is. I ordered some really minimal things myself, like one outfit, a backdrop, a wrap and a box to place the baby in. These are super enough to begin with for me. I added all the posing ideas with the prop from Etsy which are just amazingly shot and can serve as inspiration. 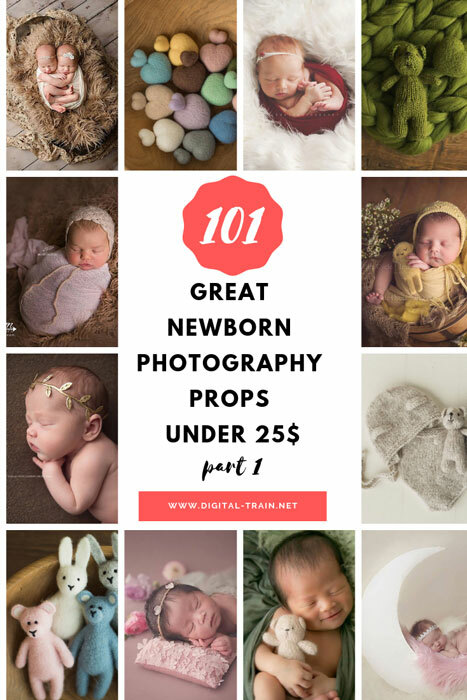 Plus, these newborn props are super cool to have and keep for friends who will surely want to give it a try at their own newborn pictures, which is a really nice activity to try out together. And if you discover in the process that this is something you really enjoy doing, newborn photography is the perfect side gig for stay at home moms. Here go the first 45 of the 101 props. Let me know which ones you find the cutest or if you have Etsy favorites of your own. And here is Part 2 of the series, with props from 45 to 101.